Set of seven Alfrex "Seven Samurai" boxed 1/6 scale figures from the Jidaigeki Real Action Figure Samurai Series based on Akira Kurosawa's classic 1954 film "Seven Samurai." Figures include - Kikuchiyo, Heihachi, Kyuzou, Gorobe, Shichirouji, Katsushirou and Kanbe. These figures were limited to just 1,500 sets and quickly sold out upon being issued in the mid-1990s. All figures come in accurate fabric costumes, w/weapons/accessories and each bears stunning likenesses of the actors who portrayed them. Individually boxed within an outer 13.5x17x6.5" deep carry case w/handle. Carry case has some scattered wear and is VF w/boxes and figures Mint as packaged. Rare. 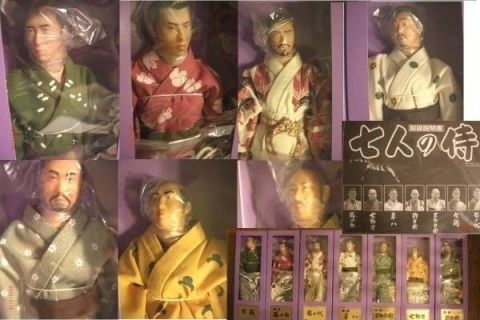 Comes w/display box of 10 mystery boxed figures by Kaiyodo that included a set of seven figures that included - Akira Kurosawa Director, Sanjyuro Kuwabata, Sanjyuro Kuwabata (Beside), Nitta no Inosuke, Nitta no Unosuke, Sanjyuro Tsubaki and Hanbei Muroto. Display box lid is loose (but included) and box shows moderate handling wear. Fine. Boxes within remains unopened and NM w/contents Mint as factory-sealed.